View of the Nuuanu Pali in Honolulu. 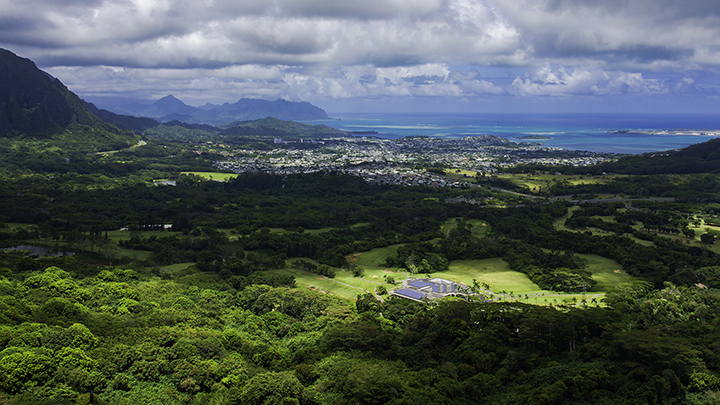 People know Nuuanu Pali as one of the most visited places in Hawaii. Tourists routinely flock to this area which some refer to as the Nuuanu Pali State Wayside. Once you arrive, you’ll be treated to one of the most picturesque views in all of the Aloha State. Here, you can see the wide expanse of the windward side of the island of Oahu. This includes beautiful Kaneohe Bay and the towns of Kaneohe and Kailua. Pali is the Hawaiian word for cliff and this nearly 1,200 feet high cliff area is a natural pass. People once used this pass in the Ko’olau’s to travel from Honolulu to the windward side of the island. In addition to being a popular scenic spot, the Nuuanu Pali is famous for its frequent strong wind gusts. The winds can often literally stop you from walking forward. Many can amuse themselves by leaning their bodies into the strong continuously blowing wind without falling over. The spot is also one of the most historic places in all of Hawaii. The Nuuanu Pali is the site of the most important battle in Hawaiian history. In May 1795, the army of King Kamehameha of the island of Hawaii battled with the army of the Oahu. Kalanikupule was chief of Oahu. Here, he fought against Kamehameha to retain control of the island. Kamehameha landed over 10,000 warriors in the southern part of Oahu. He marched with his warriors, armed with rifles and cannons from American sea merchants. He then sought and engaged the army of Kalanikupule along the way. Kamehameha outflanked and outmaneuvered his adversaries, who then had no choice except to retreat back toward Nu’uanu Valley. Kalanikupule escaped and fled the battle. But what remained of his army continued to retreat in Nuuanu Valley. They did so until they reached the cliffs of the Nuuanu Pali, where they could retreat no more. Here, many either willingly jumped off the cliffs rather than be taken prisoner by Kamehameha’s army. But other were unwillingly pushed off by the cliffs by Kamehameha’s forces. Workers who built the Old Pali Highway in the late 1800s found over 800 skulls at the base of the cliffs. By beating Kalanikupule, Kamehameha was able to add Oahu to the islands under his control. It ultimately led to his control over the islands of Kauai and Ni’ihau through diplomatic means. These events sealed his reign over all of the Hawaiian Islands. You can find the Nuuanu Pali by driving along the Pali Highway. If you are driving from Honolulu, you can see at cutoff to the lookout before you reach the Pali Tunnels. Visitors will have to pay a modest $3 fee to park and enter the area.